When were you first introduced to tea, and what do you remember about the experience? My first introduction to “tea” was with my paternal Grandmother. There were many Sunday’s spent with my grandparents for “dinner” when we were very young. The family would get together at the grandparents’ homes for afternoon dinner. These were formal occasions with everyone seated at the dining room table. Everyone was “dressed”, manners in full force, seated at the table, patiently listening to stories of the past, with a very full menu. After dinner, my grandmother would many times present her famous meringues, or petit fours, and bring out her silver tea service. I do not remember the tea itself, but the memory of beauty, comfort, and friendship that came with the special desserts, the china used for tea, and the silver tea service, all impressed me. My maternal grandfather also introduced me to something special. He was British – he came to this country from England at the age of 11. You would expect him to be the tea drinker. No, coffee was his beverage of choice, a pot always on the stove-top. When I was very young, there were some weekends spent with him and my grandmother. He would bring her breakfast in bed every morning. I would get to sit up in bed with her, she in her silk bed jacket and tea tray on her lap, and he would bring me a separate tray. On my tray he would take a saucer, place a piece of toast, pour a bit of coffee with lots of milk and sugar on it, and the toast would become toast ala café Aleut (sp??). Though this was not tea, the wonderful feeling of having a hot beverage shared with another, the tradition of it, and the ceremony created, gave me the feeling of warmth and companionship that you find in sharing today’s Afternoon teas. Why did you decide to start a tea business, and how has selling and blending tea shaped your life? Because tea became my passion. I became a tea drinker in college. But it wasn’t until my daughter was in grammar school that I discovered my love of everything tea. She and I became friends with a mother and daughter who loved having afternoon tea. We visited tea rooms, tea shops, and had teas in our homes. I began baking scones, and experimenting with teas. I gave Mothers' Valentine’s Day Tea Parties, Birthday Tea Parties, Afterschool Tea Parties, and with encouragement from friends began to offer catered Afternoon Teas to small businesses, libraries, etc. When my daughter went off to college, it was time for me to “step it up.” I wanted to open a Tea Room, and with researching realized it was too much of a risk. So I thought outside of the box, and created a Mobile Tea Truck; offering only loose leaf premium teas, tea sandwiches, and desserts. It was very exciting and customers embraced the uniqueness of it. After several years of wonderful customers, fun experiences, and sore shoulders and knees, it was time to move on. From the Mobile Tea Truck, blossomed the Mobile Tea Shoppe. I attended several of the World Tea Conferences and met other passionate tea entrepreneurs. I made connections with like minded tea vendors; using premium, organic, carefully sourced teas. I chose teas that I liked, knowing that my customers have enjoyed my offerings in the past, I was confident with my choices. But I was also aware of the wide variety of tastes that the public possess, and decided to offer at least 30 different types of tea. 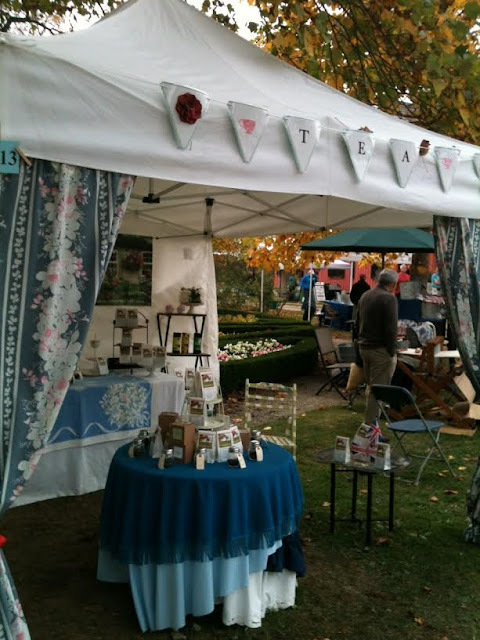 My Mobile Tea Shoppe became a moveable tea shop, setting up my tent at Craft Shows, events, and Farmer’s Market. Speaking with customers about the teas, offering education, how to prepare the different teas, where they are sourced, etc. is a passion of mine. The connections I have made through tea have shaped my life in many ways. How do you create a blend- does it start with an idea, an aroma, a taste, or something completely different? It really starts with an idea or inspiration. For example, I am a Downton Abbey fan. I was inspired by the time period. So I researched what tea they were drinking in England at that time and discovered that it was mostly Indian teas. So I created a Downton Abbey blend of a variety of Indian teas. Or the birth of the royal prince and princess inspired me to blend teas in their honor. Or a photograph – I found a beautiful picture of a Blue Jay sitting on top of a tea cup, and created a Blue Jay tea that consisted of black teas, dried blueberries, and lavender. A local tea room asked to have a signature tea blended for them, and I worked with their ideas based on a personal memory shared by the owners. It is very much like being an artist. Inspiration has come from events and location. The birth of Princess Charlotte inspired me to blend a tea in her honor. Location has also inspired me – attending events on Cape Cod inspired me to offer a cranberry blended tea. 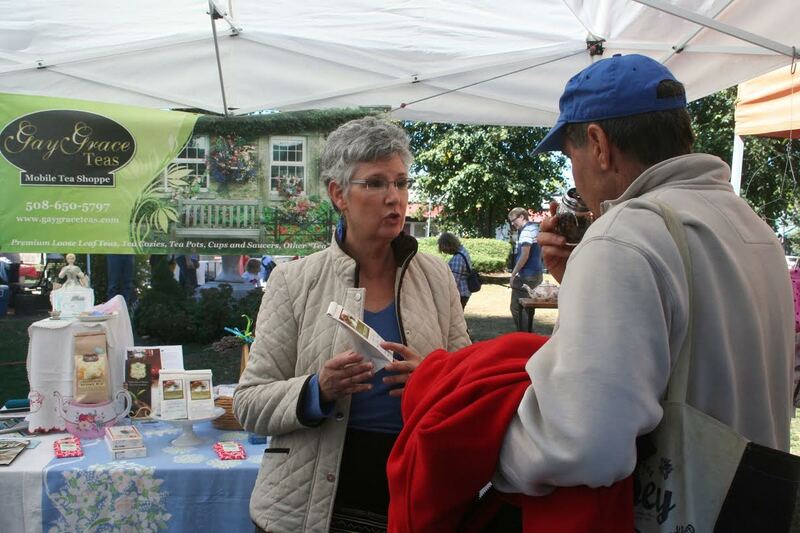 When someone visits your booth at a farmers' market or craft fair, what will they experience? The first experience can either be visual or scent. Many times someone will stop because of the visual appeal – they first see the curtains on the side of the tent with ribbons, and the distinctly tea room design. Or, they will stop because they can smell the teas. There is a round “sniffing” table at the entrance. Each tea is displayed with a sniff jar in front, so they can sniff the tea itself and see what the teas look like. This can give my customers an idea of what the teas will taste like. The sniff jars have been a big success – customers comment frequently on how much they appreciate this. What are some of your favorite food and tea pairings? That would be cheeses with fruits, and teas. I absolutely LOVE pears and apples with cheeses, and complementing teas. The unique thing with cheese and teas is that you want many times to have opposites. If a cheese is mild, like a buttery mild brie, then you may want a strong tea like a Keemum. So much fun and so delicious pairing tea with cheese! I of course love both of these separately and paired. What is your ideal afternoon tea experience? Just spending time with a friend or my daughter, over a pot of tea, sharing a delicious tea that I may have discovered, with one of my home baked scones and clotted cream. Tea and friendship! Advice for anyone thinking about starting a tea business? The obvious jumping off point is passion. You have to have this!! But the next part has nothing to do with passion. You really have to carefully investigate the business aspect. I was very lucky to have the support of a friend who had the practical, business background who assisted me with the business plan, and weekly meetings with the Small Business Administration, and Banks to discuss business loans. An integral part of starting your business is working with the municipalities that you plan on doing business in. Every town is different and navigating the process with the towns’ management teams, the health departments, and even the building departments, can really drive how and if you do your business. To be determined. I am beginning to feel the need to re-invent, but what that may be is a mystery at present. More and more tea vendors are popping up, which is wonderful for the business of tea in general. More and more people are drinking tea, wanting tea, and becoming knowledgeable about tea – also wonderful. But in order to compete you need to be unique – offer something that no one else does that makes you stand apart. The Mobile Tea Truck was a unique adventure – time for another. Thank you so much, Gay for answering my questions! 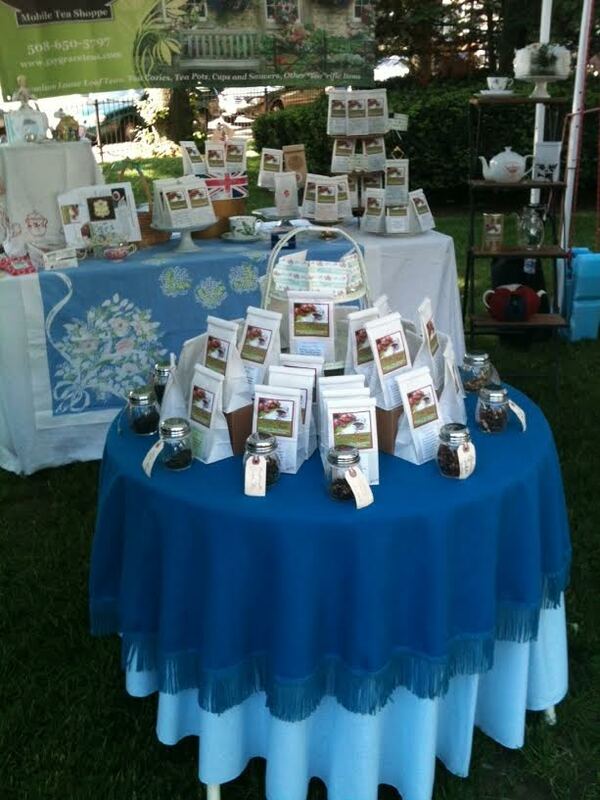 I look forward to running into you at a crafts fair or farmers' market soon!